As CP5 draws to a close it's worth looking back at what NR has achieved since 2014. A device was installed at the user-worked crossing at Borrobol, reducing the number of times the line had to be crossed to access the farm from five to one. Has a similar device been installed elsewhere, or is the cost simply too high? The very not temporary Temporary Speed Restriction at Chapelton Farm just north of Muir of Ord station was finally removed in the spring of 2017 with the installation of a different device. This allows trains to pass the crossing at line speed, particularly useful northbound. Line speed has also been increased at Delny with the installation of temporary barriers. These will be relocated at Kildonan in CP6, allowing a further increase in line speed at Delny with the closure of the LX and its replacement by a bridge. Line speed will increase by an infinite factor at Kildonan - the only place on the entire GB network where such a claim can be made. NR says the proposed date of 2021 looks challenging, but this is because of possible delays in the legal process at Delny. The big public win has been at Dingwall where two of the town's LXs have been substantially upgraded. 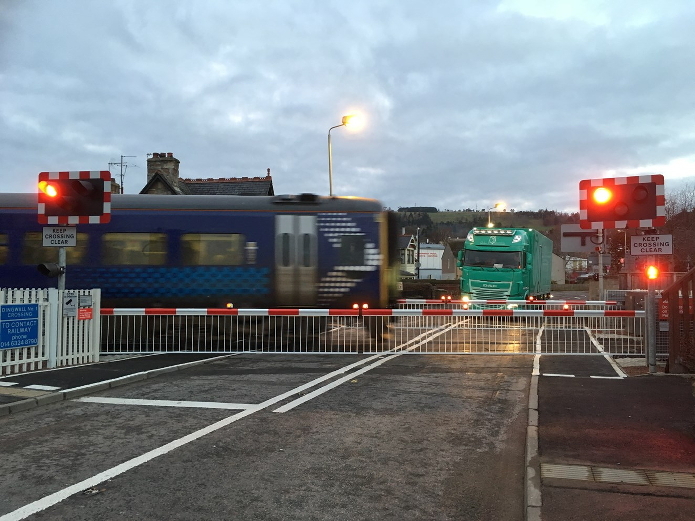 Dingwall Middle and Dingwall No.1 have been converted to full barrier crossings with obstacle detection equipment. Dingwall No.2 remains an AOCL+B. The major failure, like many others, lies with politicians at Westminster. The DfT has shamefully failed to progress the Joint Law Commissions' Report on the ludicrous (and profoundly unhelpful) state of the statute book with regard to LX matters. Apparently some parties (not political ones) object. This doesn't usually stop politicians however. Now to the future. What goodies does NR have for the FNL in CP6? Three places where there will be enhancements, and one improvement in systems. The data logging system at some FNL LXs uses obsolete equipment where spares are hard to find. Modern equivalents will be installed allowing improved fault finding. Allegations of misuse or incorrect operation should be easier to investigate. As well as Kildonan NR will provide a double line ABCL at Rogart - the other Open Crossing on the network. The proposed date of 2020 looks heroic, but NR has successfully accomplished deeds of heroism before, so we must remain optimistic. Is "heroic" more or less challenging than "challenging"? I have mentioned Bunchrew in many earlier articles: it has appeared in NR's CP6 plans for some time. The at-first-sight bad news is that it has been put on hold. The good news is why it has been put on hold. The intention was to renew Bunchrew as an ABCL, but the remit development was put on hold due to the work of the Far North Review Team as NR is looking at possible sites for double tracking or new loops. Bunchrew is one of the sites under consideration. If it is chosen then Bunchrew LX would have to be converted to a double line crossing of some kind. See ears, see music to them.